THE B-MOVIE NEWS VAULT: STOCK YOUR VAULT: New DVDs & Blu-rays for 01/29/2019! STOCK YOUR VAULT: New DVDs & Blu-rays for 01/29/2019! It's time to say good-bye to January 2019 Vault Dwellers! While this is typically a slow time of year for new release announcements, I have to say that it was a surprisingly good month for genre releases on DVD, Blu-ray, and 4K UHD! That being said, I really hope you put aside some spending money, because January 2019 is going out with a bang! Warner Archive Collection brings gives two Tarzan classics their Blu-ray debut, namely TARZAN GOES TO INDIA and TARZAN'S THREE CHALLENGES, Scream Factory brings DEADLY FORCE and SCREAMERS to Blu-ray for the first time, IN THE HEAT OF THE NIGHT joins the Criterion Collection, and Penelope Spheeris' SUBURBIA gets a nice Collector's Edition from Shout Select. Severin Films ups their game immensely this week with four new titles! First up is Sergio Martino's giallo ALL THE COLORS OF THE DARK (restored in 4K! 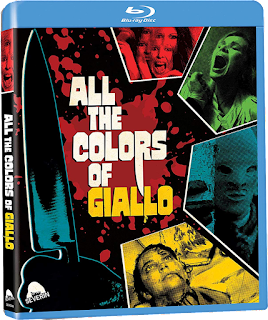 ), and a 3-Disc "companion" release entitled ALL THE COLORS OF GIALLO, which contains a new documentary, over four hours of giallo trailers, and a soundtrack CD! Severin also released two double features in coordination with Something Weird Video: MONDO FREUDO & MONDO BIZARRO and ECCO & THE FORBIDDEN! Also flexing some major muscle this week is Vinegar Syndrome, who also have four new titles! Greydon Clark's UNINVITED, Rolfe Kanefsky's THERE'S NOTHING OUT THERE, Richard Haine's SPLATTER UNIVERSITY, and Lee Frost's A CLIMAX OF BLUE POWER! Along with a good number of indie and anime titles, there's definitely something for every taste this week! To see the full roster of this week's new DVDs, Blu-rays, and 4K Ultra HD discs, be sure to scroll down!